2017 Spirited Awards® Nominee BEST NEW COCKTAIL & BARTENDING BOOK. Learn everything you need to know to craft the perfect cocktail—or two, or three…but who’s counting? 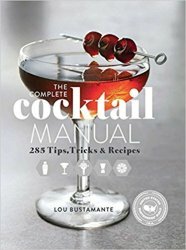 Spirits writer and expert Lou Bustamante, in partnership with the United States Bartenders’ Guild, collects the best cocktail recipes, techniques, and histories in this must-have volume that has a place in every home bar. From worldwide classics to creative new combinations and packed with expert tips from bartenders across the globe, The Complete Cocktail Manual will help you stock your bar, impress your friends, and throw one hell of a party. Setup: Get the expert-tested and bartender-approved list of what you need to set up a pro bar at home, from basic supplies and glassware to fancy gear and the ultimate shopping list. Learn all about your favorite liquors—and some you haven’t even heard of—and educate yourself on every mixer, ice cube, and tool you might need. Hospitality: Whether you’re planning the menu a week in advance or hosting on the fly, get the scoop on entertaining with ease—from food pairings to setup, party punches to supply quantities. Learn how to hack your garnish and set a drink aflame—the right way—and get some tips for dealing with intoxicated guests and next-day hangovers. This book has everything you need to know to throw the ultimate cocktail bash.